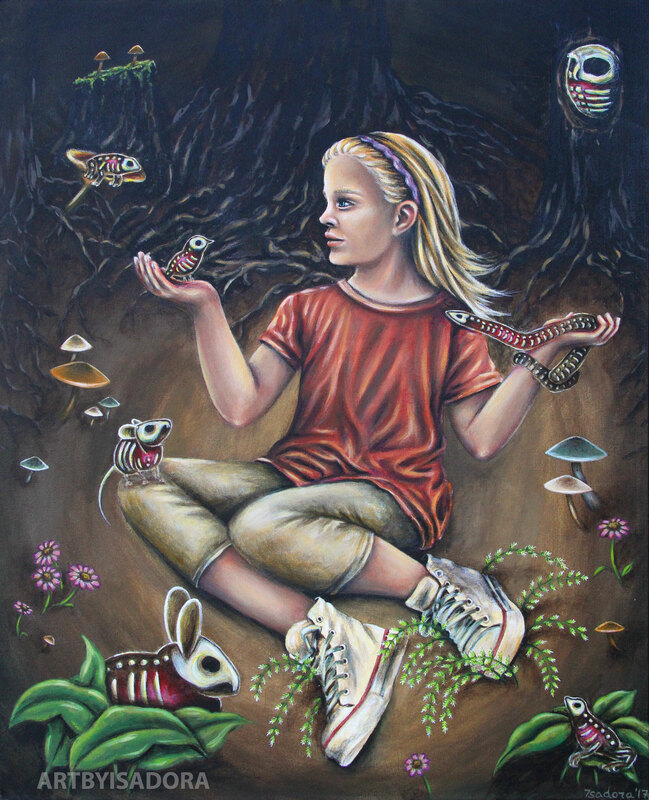 This page will be updated regularly with my latest paintings, including my comments about what inspired me to create the artwork and what dialog, whether internal or with other people, I hope the work will inspire in viewers. Please visit my Gallery page for clickable/enlargeable images of any of these paintings. This is the first piece in a new series which is currently in the works! 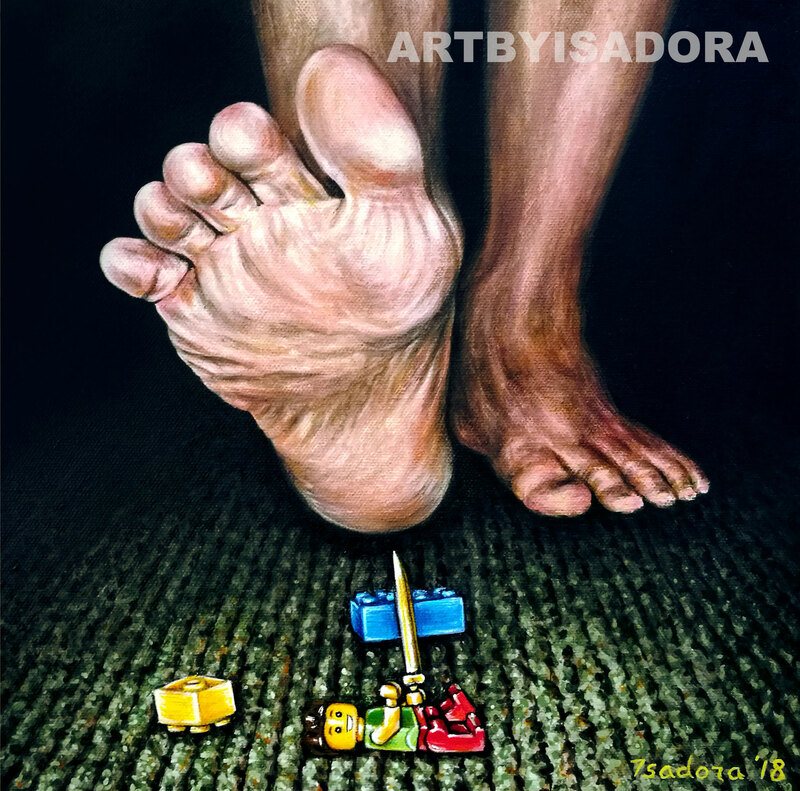 Parents, grandparents, aunts, uncles… you know the terror of a Lego to the foot in the middle of the night. Stay tuned for more pieces which document life in a family with young children. 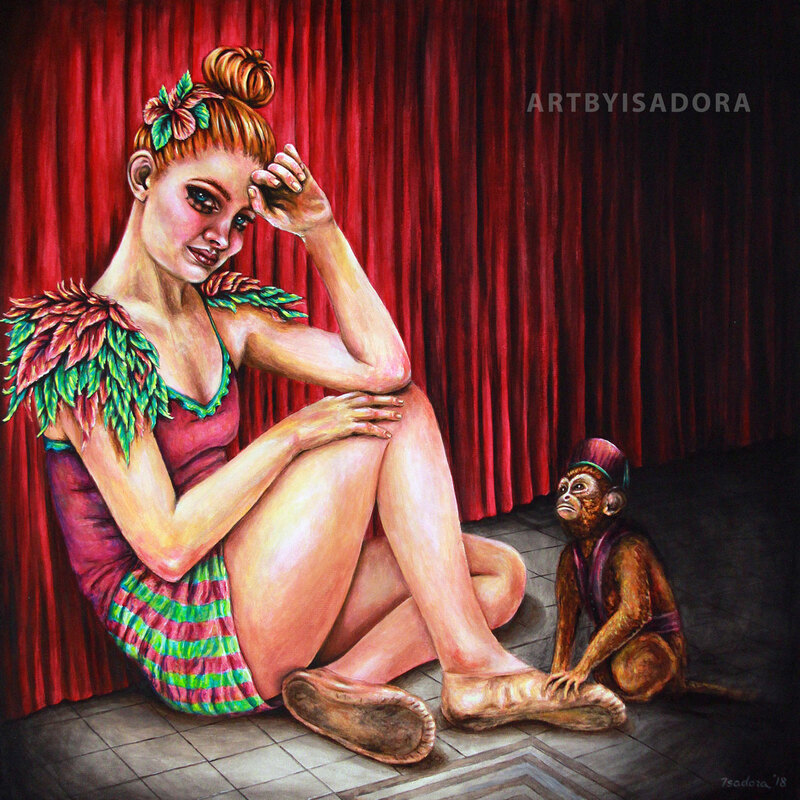 This piece is very personal to me as it is inspired by a moment several years ago when I saw my oldest daughter sitting in the kitchen after her ballet practice, looking simultaneously exhausted and powerful, vulnerable and resilient, sorrowful and beautiful. She struggles with anxiety and depression, but she battles through the toughest times by putting on a strong facade and "performing" her way through the day. I wanted to create a painting that could somehow capture the amazing complexity of that moment when she could drop the facade. The fact that she was in a performance outfit (not quite as showy as the one I painted, admittedly) was perfect. I wanted her to have a comforting friend. In reality the friend was the safety of our home, allowing her to let it all go, but in the painting I made it a monkey, because I love throwing in something bizarre! I love how the forest has this sense that anything can happen there under cover of night… worlds intersect, magic is possible, everything is alive and connected. The tree roots move across and beneath the earth like the veins of the forest, communicating with each other and every being, bringing life to every nook and cranny. 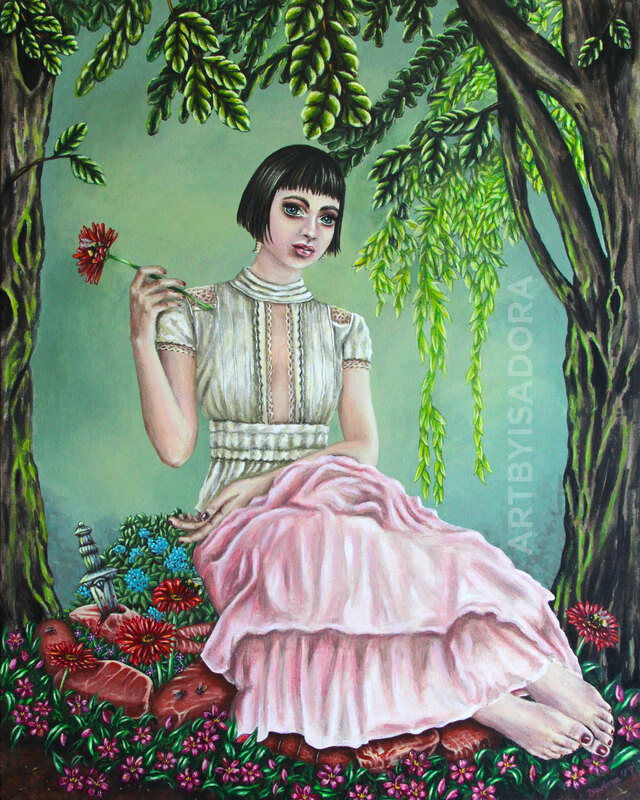 This painting is a musing on that ethereal place where a girl might go to visit old friends who have moved on - secret and safe, calm and beautiful - where her friends' souls still glow with life and love. This painting is of Miles and his monster parade. Inspired by my son’s love of the book Where the Wild Things Are by Maurice Sendak, this is my version of a little boy’s own parade of monsters, ready to make mischief in their magical dream world. 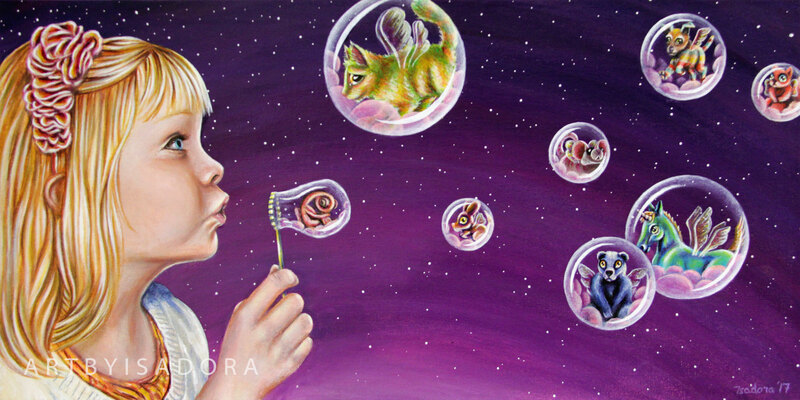 This painting is a dreamy reflection on the boundless power of love to transcend time and space. It is infused with almost a technicolor vibe, as every surface reflects a variety of gorgeous colors, which find themselves both in the world above and below. The painting is wired to hang either side up. Which would you have as the world "above"? 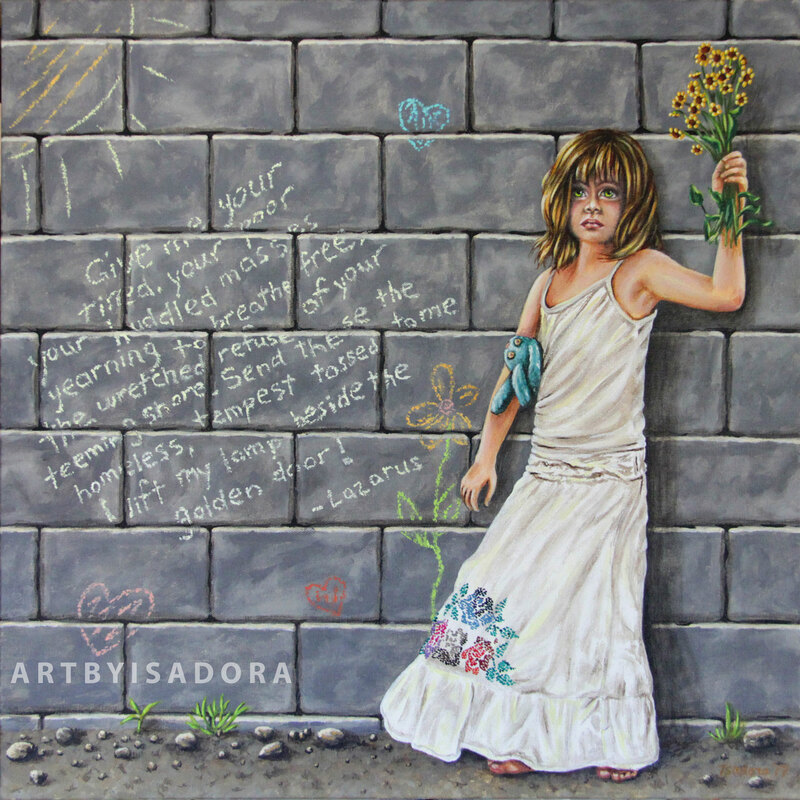 The idea behind this painting is that we all hold ourselves captive to our own perceived limitations. We feel trapped in jobs we don't like, situations we would love to escape, relationships that may not be healthy and so many other situations that we may feel locked into. "Unbound" illustrates these illusions of confinement with the surface of the water. It looks solid, impenetrable. There is freedom just on the other side, but she doesn't think she can reach it, until she starts to push, and sees her hands reaching through the surface. As a mom, I have seen the societal dialog about gender identity reaching kids and helping many of them realize that they are far from alone as LGBT. While I have been thrilled to see a lot of acceptance, I still hear stories about my teenage daughter's friends being bullied, being fearful, experiencing a lack of acceptance from their families and even from teachers who refuse to acknowledge and accept their gender identity in class. Obviously we have a ways to go achieving a safer and more supportive environment for all humans, including LBGT youth, which is who this painting focuses on. I asked my daughter what a visual might be to her of the struggle some of her friends endure with their gender identity and the way the world perceives and reacts to it. She said, "It's like being chained to the gender people expect and want from you, like being chained to what you're 'supposed' to look like, act like, and feel." 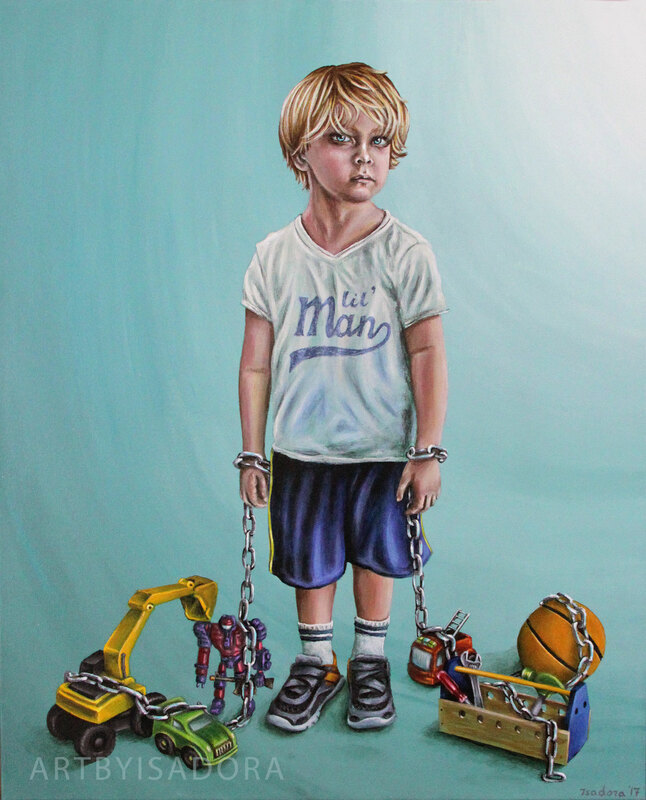 I found that to be a perfect visual of the invisible shackles placed on these kids, and I hope this painting will resonate with people to communicate the absurdity and even the cruelty of imposing their own ideas of what another person's gender identity "should" be, rather than simply accepting and embracing what it is to the person experiencing it firsthand, in themselves. A companion piece to this painting is in the works! When an empire is built upon destruction, exploitation, lies and taking advantage of the less powerful members of a population, then it doesn’t matter how you dress up the situation. It will always be an empire built upon ugliness. This is shown through the “meat hill” upon which our lovely muse sits. It’s been dressed up with flowers in a vain attempt to camouflage the truth, but beneath it all, you can still see the sacrifices that went into reaching the top. I believe that censorship begins with children. When we tell children to "hush" and not to join in the conversation, we instill in them a feeling that their words are not valuable. When we fear that their "unpopular" opinions, honest though they may be, might cause shock and embarrassment, we teach them to conceal ideas that might be considered offensive. Essentially, these children are being set up to accept censorship later, even learning to censor themselves by habit as time goes by. To the contrary, I believe that children should be encouraged to explore all ideas, and instead of being taught to censor themselves, we should teach them to present unusual and even unpopular opinions with tact and clarity. It is the child's mind, open and honest, which has the potential to grow and bring the kind of new ideas that can cause real, good change in the world… if we let them! 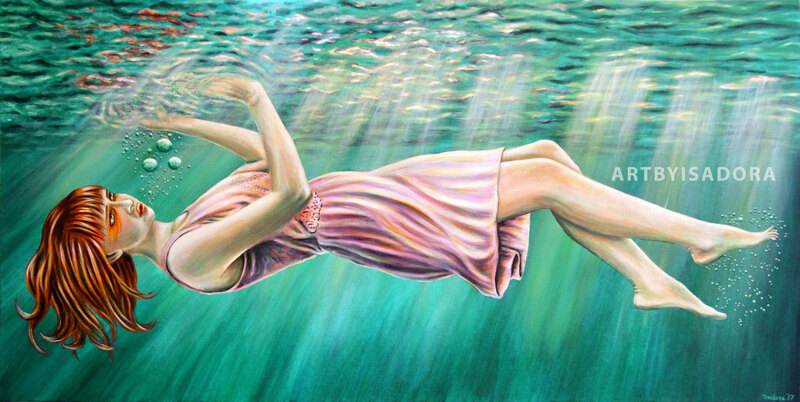 In relation to the Beneath the Surface series, this painting shouts out that nothing should be kept beneath the surface due to fear or censorship. From children to adults, thoughts and ideas are meant to be shared. 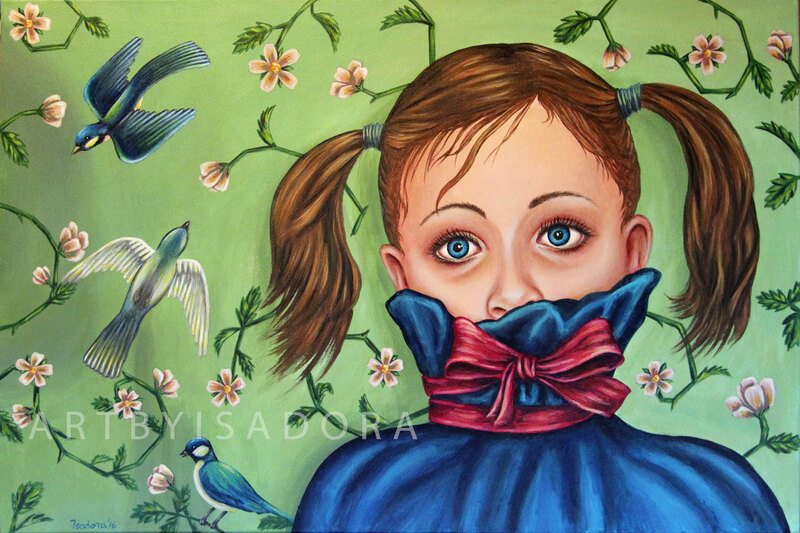 In this painting, we see the child, gagged with a beautiful bow, and if you look carefully on the left side of the painting, you'll see the shadow of the person, finger up to lips, in the "shhhhh" position. This is the shadow of censorship. This painting carries the same name as the series because it is very much what the series is about. 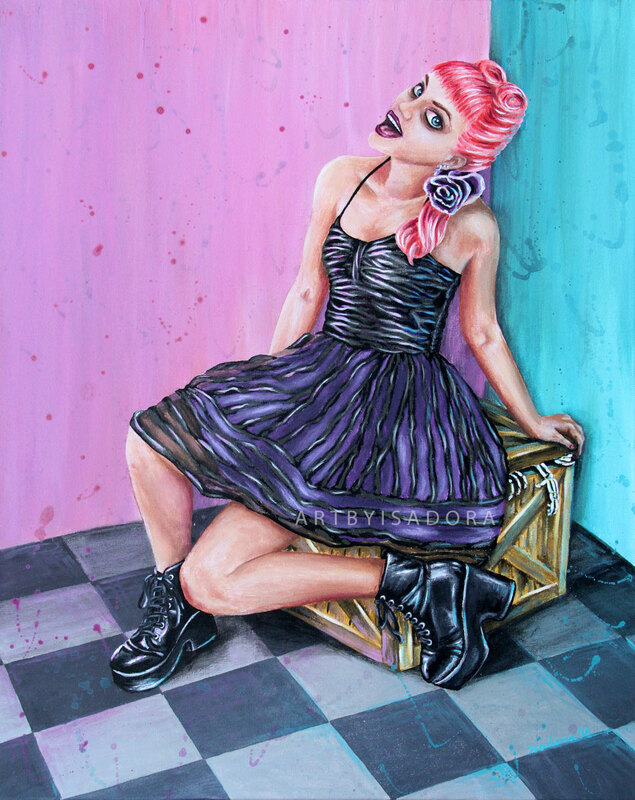 It combines humor with thought-provoking imagery, while simultaneously creating a really fun, bold painting. On one side we see the happy image of a little girl walking along a sunlit sidewalk, lollipop and teddy bear in hand, with her plucky little orange tabby trotting along behind. The only hint that all may not be as it seems is the somewhat pensive look in her eyes. They are not the vacant doe eyes of the oblivious. The other side, in its generalities, is a mirror image of the first. However, this is not the candy-coated image we see in its counterpart. This world is grimy, the girl's hair is mussed, she's stepping in gum, and in place of her lollipop is her bear's head (damaged). The remainder of the bear, tucked under her arm, is headless and grimy. In place of her kitty companion is an equally eager raccoon, but he seems to have a bloody mouth, as does our little girl. So, I ask you, which is the real world? Which is the more truthful image of the girl? Are we ever 100% ourselves? Perhaps the biggest question is, which side would you hang up? 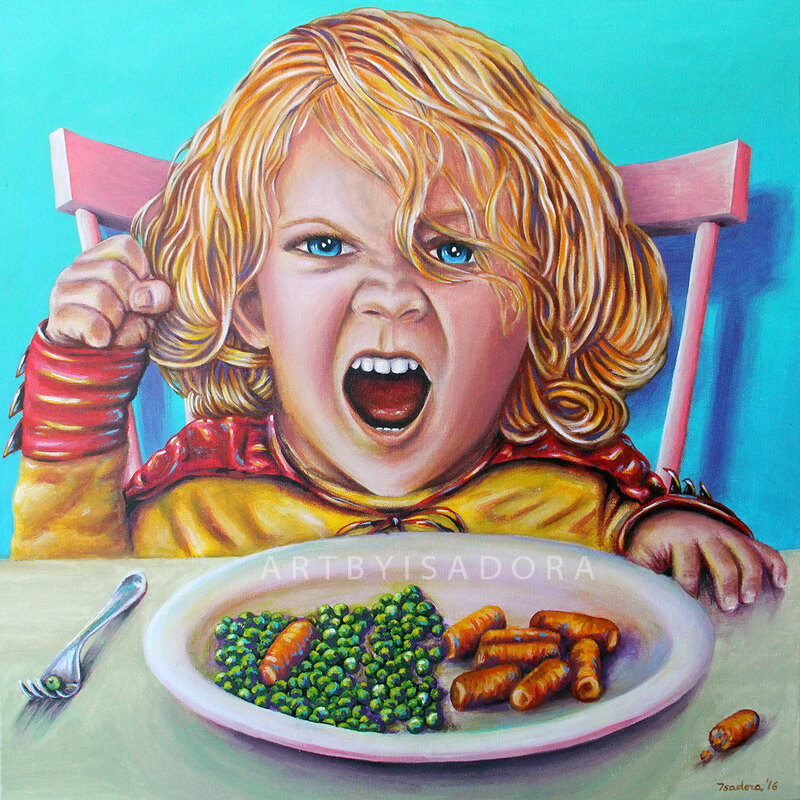 Hang this panting in the kitchen or dining room, and you'll never feel alone while lamenting over having to eat your vegetables! In relation to the "Beneath the Surface" series, this painting is a fun, bold image of The Costume. We all start putting on costumes when we're little kids. It's fun to dress up and pretend to be something or somebody entirely different for an afternoon. We would put on the superhero costume, for example, as in this painting, and instantly we would feel powerful and ready to take on anything. Underneath we were still the same, though, and a few vegetables could shatter that shell instantly! Like so many people, I am horrified at the suffering going on all around us. Every day the news overflows with it. The rhetoric we hear is that we must take care of ourselves first, to "be safe" from the other, the outside, the over there… meanwhile divides grow within the borders of our own country. It crumbles from within while fear, hate, politics and greed gnaw at the very core of who I thought we were. No wall will keep that out. No amount of turned backs will shield us from our own hypocrisy. When I was a kid, I believed we were good, that our nation was a beacon of hope, help and welcoming to anybody who came to our shores in need. I saw photos of the Statue of Liberty, and read Emma Lazarus' words, and felt proud to be an American. This is not to say that I'm not proud now, nor do I have any profound cure for the cancer that eats at our moral core. I painted this with both sadness hope. I know that so many other people would choose love over hate, welcoming over fear. I don't disagree that there are very real dangers and true evil out there, but they are not only beyond our borders, and closing some out closes out so many more who have their own evil to escape and desperately need that "lamp lifted beside the golden door." Secrets. We all have them. But what happens when a person tries to hide too many secrets, or secrets that are just too much a part of who they are? They lose sight of themselves and they they live in fear of people discovering "the truth" about them. This painting is about what can happen when somebody lives their life trying to stuff those secrets below the surface, away from sight. She's trying her best to keep a sweet, smiling exterior, but the chaotic paint splatters all around her and the skeletons pushing their way out of the crate tell a different story. It's painted with humor and fun, but I'm a firm believer in transparency. If people don't like you for who you are, you don't need them anyway! Designed to be hung as a pair. Dreams are those hidden gems that live inside all of us. You can't see them, but every person you walk past each day has them. They inspire us, they motivate us… sometimes they even scare us a little. All of that is wonderful! The real magic happens when we let them loose into the world. When we set aside caution and release those dreams with every breath of hope and effort we can muster, we give them a chance to come true. 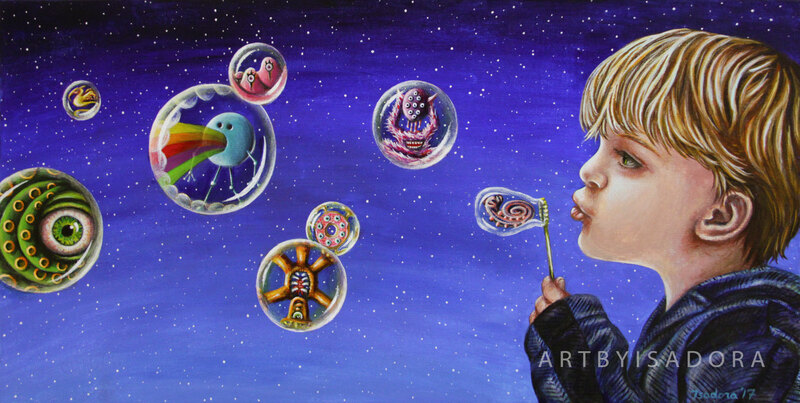 But dreams are fragile, and most of them will burst, like bubbles, and be no more. 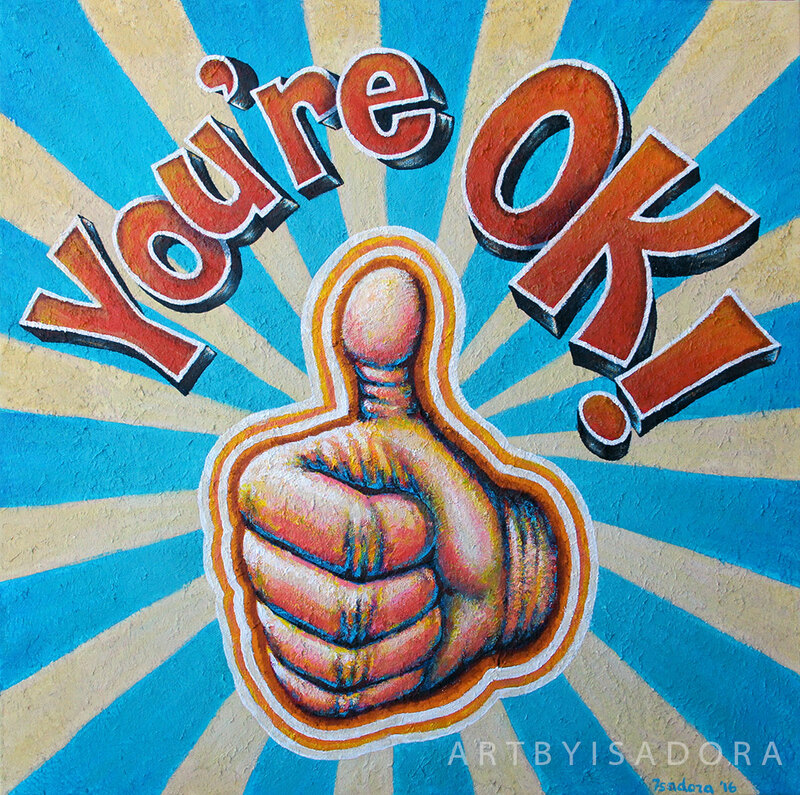 That's ok, though. It's important to recognize that simply having the dreams is a beautiful thing. Attempting to realize them is beauty in itself, like the bubble that glistens with rainbow reflections and plays in the wind for just a few moments. Even more magical is that special, seemingly magical bubble that doesn't pop. If you've blown enough bubbles, you know this one. It will eventually catch the wind and fly off into the atmosphere. It won't burst, and just becomes more and more amazing as it dances off in the sky. So, keep on dreaming, Dreamers. This one's for you. 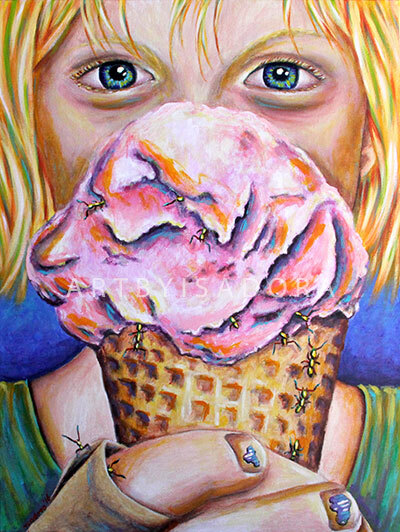 This painting at first appears to be a sugary-sweet image of a girl enjoying her ice cream. That's the image you'd see in your social media feed, as the mom gushed about her perfect life, her perfect kids, and the oh-so-perfect afternoon they had at the ice cream store. The truth is, those moments are rarely real. We're tired, we don't enjoy every moment of our lives, and that perfect moment with the ice cream would probably be followed by, for example, the discovery that there were ants on the table and now they were all over the ice cream. This isn't a bad thing, really. It's life. It's flawed and funny and it's full of a million less-than-perfect moments that make us laugh and cry at once. It's time we celebrate that imperfect beauty, and just quit it with the perfectly posed facade.